Hi. To celebrate the fact that you haven’t had to deal with me or my nonsense for about 17 years on diskant, I thought I’d come back and do something vaguely generous (even though no-one knows who I am any more), all inspired by Marceline’s excellent post about everyone’s favourite kind of music, Other. Some genres are uselessly broad, but well-meaningly applied. Remember trips to Our Price back in the early 90s? They split the whole world into the opposing forces of Rock/Pop and Dance, and if you were lucky and got a larger branch you could probably find a small Classical section (theoretically everything from 14th century secular music to Varèse, Xennakis, Pärt, Gregorian Chant, Vanessa Mae and allsorts in between, realistically only containing Vanessa Mae and a Classic FM compilation of Hovis adverts), Soundtracks (likely only containing 2 CDs, Buster and The Lost Boys) and Jazz (a handful of dreadfully recorded budget CDs of Charlie Mingus’ worst gigs). At the other extreme, some genres, especially in the world of electronic music, are so convoluted and narrow as to seemingly only apply to one actual track. Others still, in this day of mp3s, are intentionally inaccurate, just for the lulz. Who hasn’t giggled mischievously while changing the ID3 tags on a Purulent Spermcanal album to ‘Children’s Music’? But if you’re the kind of person who does actually label mp3s with genres, it takes a special kind of slack-jawed vacuousness to resort to something as unimaginative as ‘unknown’. I can understand my Granddad not knowing about recent developments in the Abuja power-electronics scene, but how does someone who doesn’t know how to classify Heavy Winged acquire it in the first place? It’s most likely, I suppose, that they’re ripping the CDs with something like Windows Media Player, and since the tracks don’t correspond to anything in the Gracenotes database, it’s deciding on your behalf that the music is too weird to sound like anything currently out there. But that can’t be true of all cases. So then, I’ve been through my iTunes library and identified that I have quite a lot of ‘Other’. And there’s a really interesting range there – everything from lengthy spoken word stuff like Douglas Adams’ The Salmon of Doubt, the Hammond organ easy funk of Alan Hawkshaw, Ruins’ gonzo prog-metal, The Conet Project, all the way to stuff as shockingly mainstream as Scott Walker, TV on the Radio and – gasp – U2. In some cases, obviously only one or two tracks from an album have been ‘Othered’, the rest presumably being labelled correctly. I wanted, therefore, to put together a Best of Other compilation – to see whether it turned out that it was all garbage, or whether it would make a credible self-contained listening experience. As it turns out, narrowing down 733 tracks (a total of 3.2 days of non-stop listening) down to the 10 or so necessary to fit on a CD is not possible. So I’ve lovingly and painstakingly sequenced and hand-crafted 3 discs’ worth of wonderful music, all of which has been categorised by somebody (not me!) as ‘Other’. All of which has baffled somebody enough for them to not be able to classify it adequately. I’ve deliberately avoided stuff much over 10 minutes in length, even though it might be awesome, just to fit as much on there as possible. This means, sadly, no Orthrelm (Ov is 45min), no Keiji Haino (Affection is 58min), Radu Malfatti (Rain Speak Soft Tree Listens: 61min) or Jonathan Coleclough (Casino/Tree Frogs/Beach: 58min), all of which I love as much as anything non-Other. I now proudly present The Ultimate Very Best Other Album in the World Ever, Volumes 1-3 for you to download and enjoy. These will all conveniently fit exactly onto one CD each, so you can burn them and give them to your family for Christmas. I’ve even spent some time suggesting the correct genre for each track – because after all, there is only one right answer. 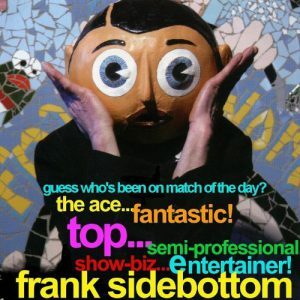 It was genuinely sad news to hear thatFrank Sidebottom (or rather Chris Sievey) had lost his fight against cancer a few weeks ago. When news initially broke that he had unfortunately got the disease the fact that he was continuing to perform on the live circuit suggested that he was going steamroll and power through the illness. Sadly this was not to be. Originally I thought Mark Radcliffe was Frank Sidebottom or vice versa but soon it became apparent that they were both birds from the same tree, from a rich Manchester scene with a staunch and glowing legacy. Frank Sidebottom was a hilarious creation, a lo-fi character that was always around but never seemed to quite get the breaks or the right vehicle with which to work his magic. Undaunted however he kept plugging away in a manner that should serve as true inspiration to anybody in either comedy or music that carries on regardless in the face of slack apathy. Prior to this year’s World Cup beginning Frank was already pushing his World Cup single (hey, he might as well, every other schmuck was) and as soon as his passing was announced immediately people on Twitter began suggesting that his fan base get together and attempt to fire the single to the top of the charts. Quickly some kind of campaign began to take place and before long a realistic amount of followers looked in place to get the song a decent chart positioning. Unfortunately things then took a turn for the worse as it was discovered that Sievey had passed away without leaving any assets and it appeared that his family would not be able to afford a fitting funeral for such a treasured performer. With this the Twitter campaign took on a different role and within days £21,000 had been raised for his send off. Now the time has come to release the single. Originally it was supposed to be “3 Shirts On Me Line” but I sense/fear that that song was never correctly recorded in time. Instead the good people at Cherry Red have quickly pulled together this digital single of typical Frank delivery in the style of George Formby gone chipper, Manc and mental. The song barely lasts a minute but that’s not the point, its Frank! Under such circumstances who can deny? The other track is “The Robbins Aren’t Bobbins” which is his ode to his beloved Altrincham. It sounds like it’s from a different era, which is perhaps/probably is. Seldom do charity records feel worthwhile but for once this release does as it represents tribute to a genuine and truly entertaining individual that is a sad loss to the profession and industry. For years I have vowed never to open an iTunes shop account but especially for this release I did. With proceeds going to cancer charities here is hoping that the record places high on Sunday 11 July (World Cup Final day). It will, it really will.